I must have seen too many bad films involving car parks, but the places give me the creeps. The low ceilings, the dim lighting, the sinister odour they exude. Shiver. I am all for the German law which requires the allocation of a number of designated parking spaces for women at no extra cost. But I have to say I was rather taken aback at my last trip to Frankfurt airport. 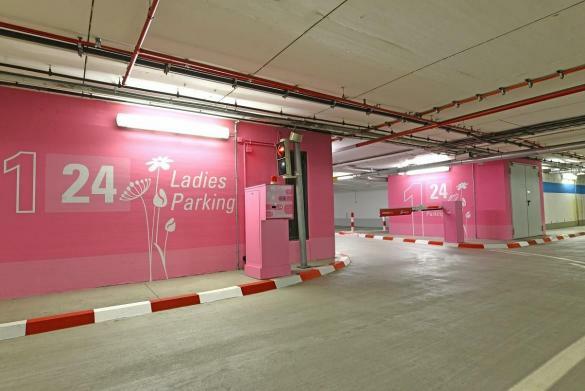 They have redesigned the women's parking areas from top to toe in a look that wouldn't be out of place in a Barbie or My Little Pony toy set. There are pink walls and pink ticket dispensers. There are flowers and the words 'Ladies (sic) Parking' just in case you were in doubt. I have nothing against pink in the right place. I noticed that my deodorant has a similar pink packaging, but, well, it's from adidas, which is normally a manly sort of brand, so they have to make things clear. And the whole thing is only about 10cm big and tucked away in the bathroom. But this expanse of pink, and flowers - I'm not sure. It's not clear what the advantages are for me to park here rather than in one of the grey unisex bays, other than it's prettier and girlier. I would hope that this area has more thorough CCTV monitoring (there were some nasty incidents at Frankfurt Airport a few years back) but it's certainly not nearer to the terminal. The thing is, most women who park at the airport are surely business women. Exactly the sort of women who don't want a pink laptop or mobile phone. I note that the agency responsible, Damm & Bierbaum in Frankfurt, is run by two chaps called Dirk and Philipp. They even had flyers (arf, arf!) designed in "handbag-look" for the launch. Hmm. And another thing I didn't like. I've got a red car. It clashes dreadfully against those pink walls. I have used My Little Car Park too - it is extremely well positioned near the exit to the terminal. However, the pink? Boys, seriously? Do you think we are three? My mother noticed that it was perfumed. It even smelled pink. Now, that's interesting - I thought I was imagining the smell! 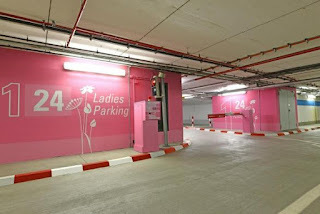 At least a way to make it really a women's parking (secure) and keep away those "clever" male drivers (near the exit) as the colour code could be too embarassing? Good thinking, Silvia - maybe there is a hidden devious strategy there! Definitely, it keeps the Testosteron out of the way. Thats just it. If this doesn't help, I dont know. I was more than once angry about the 350+PS cars – one of them needing two parking places – being selfishly planted in that area that was nicely close to the exits where I could get away from the scary grey garage endlessnesses. I know what you mean - even I hesitated about driving in there cos it was so...pink. So imagine how a macho man with a tuned-up Batmobile-wannabe would feel! Love love love love this!! LOVING those colors!!! !